I love my lazy Sunday mornings. Sleeping in, making a nice, leisurely breakfast, enjoying a second cup of coffee and lingering in my pajamas until early afternoon. These mornings are meant for something sweet and comforting, but not too complicated to make (after all we're talking lazy Sunday morning here)....enter the Scone! Now, I admit, I wasn't always a fan of scones (read more about that here), but since I've started baking my own scones at home, a whole new fabulous world of scones has opened up to me, my kids like to call it the Scone Zone. These Cinnamon Scones are light, tender and flaky just as any great scone should be. The cinnamon-sugar topping adds just the right amount of spice and sweetness. I love that the dough is sweetened with honey instead of the traditional granulated sugar. The earthy sweetness of the honey compliments the spiciness of the cinnamon perfectly. Using buttermilk, instead of heavy cream or half and half, adds acidity and gives the scones a slight tang. The glaze, while not necessary, is reminiscent of your favorite, decadent cinnamon roll (but without all the work!). That's a definite win-win in my recipe book. The next time you're enjoying a leisurely Sunday morning and want an easy and delicious breakfast treat, why not try these simple, cinn-full Cinnamon Scones? Preheat oven to 400f and line a baking sheet with Silpat or parchment paper. Place the buttermilk, honey and egg yolk in a small bowl and whisk to combine. Set aside. Place the 2 cups of all purpose flour, baking powder, baking soda and salt in a large bowl and whisk to combine. Add the cold butter to the bowl and, using a pastry cutter, cut the butter into the flour mixture until the butter is the size of peas. Add the wet ingredients and fold to combine. Turn the dough out onto a lightly floured surface and gently pat into a circle about 8" in diameter. Using a knife or bench scraper, cut the circle into 8 triangles. Place the triangles on the prepared baking sheet. You can place them on the sheet individually or in a circle. In this case, I decided to keep them in a circle for better presentation purposes. Tip: If you feel you have over handled your dough, place the baking sheet in the fridge for 15 minutes to chill before baking. Lightly brush the scones with egg white then sprinkle with the cinnamon-sugar mixture. Bake 10-12 minutes or until light golden brown. Test for doneness and remove. Place the baking sheet on a cooling rack and allow the scones to cool for a few minutes before glazing to ensure your glaze doesn't run off of the scones. Drizzle with glaze. I like to use the tines of a fork to do this. Just dip the tines of your fork in the glaze and drizzle away. Scones are best enjoyed the day they are baked. If you need to make these ahead, apply glaze just before serving to prevent the scones from becoming too soggy. Spring time is the perfect time for lemon desserts. I admit I'm pretty lucky since I have a beautiful lemon tree next door which provides the best, juiciest lemons ever! A few weeks ago I started working on this recipe for a Baby Shower we were catering for a friend. I needed a Lemon Cupcake recipe with a fruit topping. I found a recipe online with the combination of ingredients I wanted to use for this cupcake. I tried it once as the recipe directed, but was not happy with the consistency of the cake (not enough lemon flavor and not moist enough for me, and the frosting was a bit too sweet). Faye and I discussed how to modify the recipe a few times and I did a few more trial runs and in the end these lemon cupcakes turned out absolutely delicious! They're moist with the wonderful fragrance and flavor of lemon, and once you top them off with the Blackberry Frosting they're just perfect! I have now made these cupcakes for an Easter brunch and also for the Baby Shower and each time they were delicious. 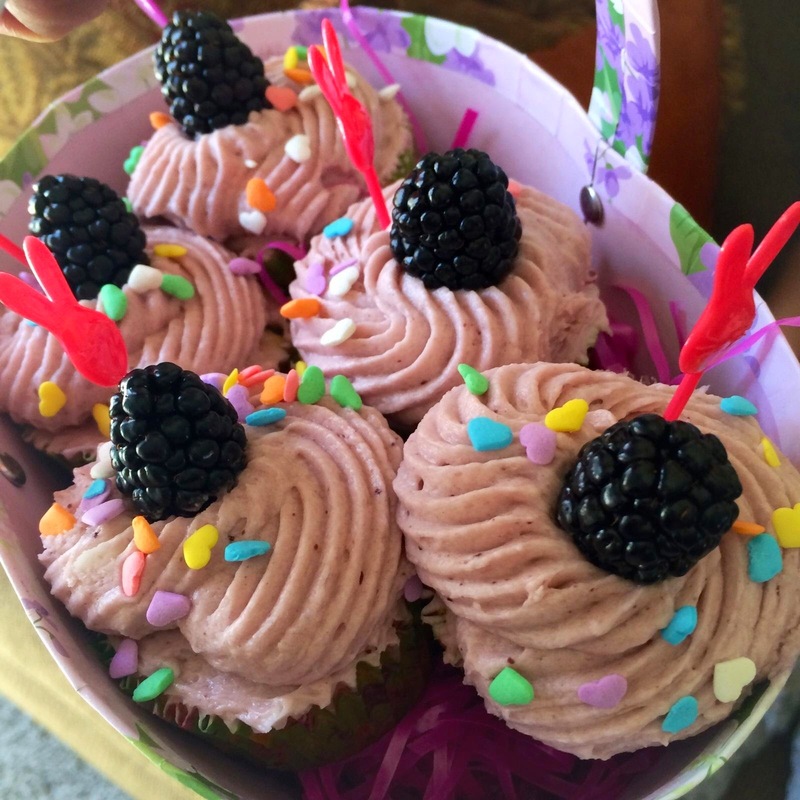 I hope you give my Springtime Lemon Cupcake with Blackberry Lemon Buttercream recipe a try for Easter. Your family & guests will love it! Place 1 cup of granulated sugar and the lemon zest in a small bowl. Using your finger tips, squeeze the zest and sugar together to release the oils from the zest into the sugar. The sugar will become very fragrant. Set aside. -In a large bowl, mix flour with baking powder and salt with whisk. Set aside. -Beat ½ cup of butter with the 1 cup of lemon sugar for about 3 minutes, till light and fluffy. Add Vegetable oil and mix until combined. -Add eggs, egg yolk and vanilla. Beat till well incorporated. -Mix in the flour mixture just until incorporated. -Combine the half and half with the lemon juice in a small bowl. Gradually add this to your batter just until combined. Do not overbeat. -Divide batter evenly between the prepared pans. -Bake for 16-18 minutes, remove from oven and place the pans on cooling racks. Remove the cupcakes from the pan and place on a wire cooling rack to cool completely. Beat softened butter and vanilla. Gradually add powdered sugar till creamy. Finally add the blackberry jam and lemon juice and mix until well combined and fluffy. Frost each cupcake and add a blackberry on top. If you've never had Birthday Cake M&M's, they're basically a chocolate M&M with a hint of vanilla flavor. They are sweeter than the basic chocolate M&M so I wanted to add dark chocolate to help balance out the sweetness. I also wanted to highlight the "birthday cake" factor and what screams birthday cake more than sprinkles? This is an easy, fun and delicious cookie and it doesn't have to be your birthday to enjoy them! I hope you give them a try!! Combine flour, baking soda and salt in a medium size bowl. Whisk to combine. Set aside. Cream butter and both sugars in the bowl of your electric stand mixer fitted with the paddle attachment until light and fluffy (approx. 2 minutes). Add eggs and vanilla extract and mix at low speed until combined. Gradually add the flour mixture, mixing at low speed just until combined. Add the M&M's, chocolate chips and sprinkles and pulse a few times just until combined. Cover and chill dough for 30 minutes. After dough has chilled, preheat oven to 350f and line baking sheets with parchment paper. Roll into 2" balls and place on parchment lined baking sheets. Press down each ball of dough slightly and carefully add some sprinkles to the tops, pressing the sprinkles slightly to make them adhere to the dough. Bake approximately 12-15 minutes (rotating sheets halfway through the baking process) or until edges are golden brown. Remove baking sheets from oven. Allow cookies to cool on the baking sheets for a few minutes then remove the cookies to cooling racks to cool. Store leftovers tightly covered in an air tight container for up to 2 days. They make absolutely delicious desserts, cakes and amazing chocolate croissants . Yummy!!! Well, one of my favorite things (there are many favorites there, trust me) is the Oatmeal cookies he makes. But this is not your ordinary oatmeal cookie, he covers them with a lemon icing which is absolute delicious. Well, a few weeks ago I was craving these cookies and the bakery was closed so I thought I would try to make something similar to it. I took a different spin and made a Maple Walnut Oatmeal Cookie with lemon icing. 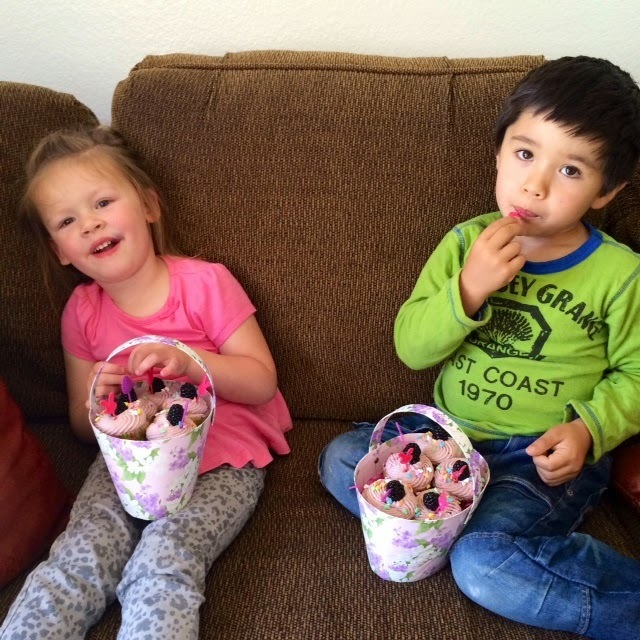 Let’s just say they were a HIT!. These cookies have amazing lemon flavor and the combination with the maple and walnuts is so delicious that honestly it is hard to describe. I have added this cookie to my favorites list! Also a tip, if you’re ever in a specialty food store and they have Maple Sugar makes sure you pick it up! I didn’t even know it existed! But now it is a must in my pantry. I hope you give these cookies a try. Absolutely delicious! In a mixing bowl and using an electric mixer, cream butter till nice and creamy. Add brown sugar, white sugar and maple sugar. Mix in till combinded. Add maple sugar and egg and vanilla and 3 tablespoon of water, and mix till all combined. Using a medium size ice cream scoop, drop dough rounds on to a cookie sheet. Set dough balls at least 2 each apart . Remove from oven, wait 1 minute before transferring on to cooling rack. While cookies are cooling, make icing. Combing powder sugar, lemon zest, lemon juice and vanilla. Stir with fork. If its too thick, add a little more juice from the other half. But the icing needs to be on thick side. Aside from the catchy name, these bars are insanely delicious. If you love the combination of sweet & salty, this recipe is for you. Imagine a basic blondie with chocolate chips and chopped pretzels, topped with a homemade peanut butter caramel slathered with a rich dark chocolate ganache then garnished with mini pretzels. If that isn't cookie bar heaven, then I don't know what is! I made these bars for Elizabeth from Food Ramblings for this month's Leftovers Club exchange. Although they require a little extra work than the standard cookie bar, I wanted to make something extra special for Elizabeth for all of the hard work she puts into hosting the Leftovers Club every month. I hope she enjoyed eating them half as much as I enjoyed making them! If you're interested in joining the Leftovers Club, I encourage you to sign up at Food Ramblings. It's so much fun to send & receive yummy baked goods in the mail every month! Place the granulated sugar and water in a medium size heavy bottom saucepan. Bring to a boil over medium heat without stirring. Continue to boil over medium heat until the mixture turns a light amber color. Be sure to watch carefully to prevent burning. Carefully whisk in the heavy cream and cook for another 30 seconds to one minute or until the mixture turns the color of peanut butter. Remove from heat and whisk in peanut butter, corn syrup, vanilla extract and a pinch of salt. Transfer to a bowl and allow to cool to room temperature. Store in refrigerator until ready to use. Preheat oven to 350. Line a 9"x13" pan with non-stick foil (or spray regular foil with non-stick cooking spray). Combine flour, baking powder, malted milk powder and salt in a medium size bowl and set aside. In the bowl of your stand mixer fitted with the paddle attachment, cream butter and sugars until light and fluffy. Beat in eggs and vanilla at low speed until combined. Scrape down bottoms and sides of bowl. Add the dry ingredients and mix on low speed just until combined. Using a rubber spatula, fold in the chocolate chips and chopped pretzels. Bake at 350f for approximately 30 minutes or until edges are set. Remove from oven and allow to cool completely. When bars have cooled, spread the peanut butter caramel into an even layer over the top of the bars. Refrigerate until the caramel has set (approx. 1 hour). Tip: If the caramel has been refrigerated, place it in the microwave and heat in 30 second intervals (stirring between intervals) until spreadable. Place the chocolate chips in small bowl. Microwave the heavy cream until hot and steamy, approx. 1 minute. Pour over the chocolate chips and allow to sit for approx. 3 minutes. Stir until melted then spread over the peanut butter caramel. Garnish with mini pretzels then allow the chocolate to set. Once chocolate has set, cut into bars and serve. Store leftovers tightly covered in an air tight container for up to 3 days.